Jconnect Inside Jewish India- Entwine trip to India! All spots for this trip are filled. 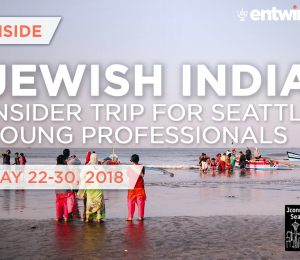 Inside Jewish India, in partnership with connect, is a one-of-a-kind opportunity for young professionals from the Seattle area to experience the magical and vibrant Jewish community of Mumbai. Participants will experience the complexity of Indian society today and connect with members of the small, but mighty local Jewish community. -Site visits, briefings, tours, etc. -Experience the diverse Indian Jewish communities of the Cochin, Mumbai and Konkan regions -- including the isolated Bene Israel. -Visit Mumbai's famous attractions including the Gate of India, Banganga Tank, the Hanging Gardens, and more!